In a collaborative effort between the laboratories of Randall Johnson, UCSD professor of biology and Victor Nizet, associate professor of pediatrics at the UCSD School of Medicine, research has found that treating white blood cells with chemicals to increase HIF-1 levels could enhance the cells’ capacity to kill bacteria. In this study, the researchers compared how well macrophages in which HIF-1 levels were elevated, normal or zero could kill bacteria, including Streptococcus isolated from a patient with flesh-eating disease. 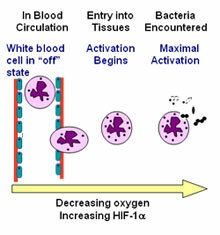 They found that the greater the HIF-1 levels in white blood cells, the greater their bacterial killing power. They also found that mice lacking HIF-1 in their macrophages and neutrophils were less able to combat skin infections than normal mice. The study will be published in the July, 2005 issue of The Journal of Clinical Investigation.